Organic solvents and blended solvent compounds are among the most powerful industrial cleaning options on the market today. Unfortunately, some of the most effective organic solvents also pose significant safety and regulatory risks due to concerns about hazardous ingredients, high Volatile Organic Chemical (VOC) content, non-biodegradable components, and flammable or irritating fumes. Water, on the other hand, is a safe, cheap and convenient solvent ideal for dilution and rinsing. But due to its polar nature, non-polar organic liquids and compounds do not generally dissolve very well in an aqueous environment. Emulsions can bridge this gap by dispersing small droplets of organic solution in an aqueous environment (or vice-versa). In typical “macro” emulsions, droplet sizes are around 400 nm, which results in opaque, milky-white solutions resembling mayonnaise or hair conditioner. Forming these emulsions generally requires energy-intensive, high-shear mixing, and without additional stabilization or homogenization, these emulsions tend to be thermally unstable and can separate over time. Many of these issues could be solved if the organic phase could be dispersed in smaller droplets around the 100 nm range. These “micro-emulsions” are generally transparent and require only gentle mixing to combine the two phases. But in order to stabilize such small droplets, a unique range of surfactants – specifically tailored to both the organic and aqueous phase – is needed. The Sta-Sol® line of micro-emulsions are designed to produce stable micro-droplets that harness the best properties of both organic and aqueous solutions, allowing the organic phase to dissolve grease-like residues, resins and other soils while the aqueous phase makes it easy to dilute the solution and rinse it away. 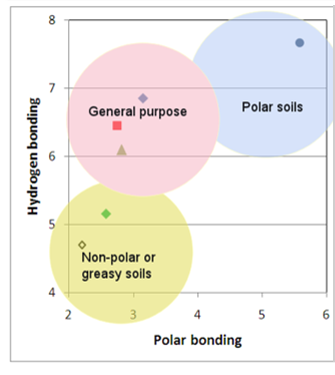 Organic stains and residues typically fall within a solubility “envelope” based on two parameters: their tendency towards hydrogen bonding and their degree of polar bond formation (or lack thereof). It is important to choose a solvent within the desired envelope in order to be able to dissolve a particular soil or resin. The family of Sta-Sol® ME products combine unique surfactants with organic solvents to cover the most common solubility ranges, allowing micro-emulsions that match the targeted soil to form in water without affecting other components. Once the product in the proper solubility range is selected, the micro-emulsion can be used as-is or diluted with water to desired levels. Sta-Sol® ME products are sold as water dilutable concentrates. Most of our micro-emulsion concentrates are dilutable from 0 – 100%. Sta-Sol® ME 2100C is dilutable from 0 – 50% and 90-100%. The wide dilutability ranges allow for flexibility and cost-effectiveness in formulations and end-use cleaning applications. Because these micro-emulsions are designed to disperse easily and stay in solution, they present lower VOC concerns (exempt per consumer products regulations), and are safer than many alternatives. Even in their highly concentrated form, they are biodegradable, non-flammable, not listed as carcinogens, and do not contain any hazardous air pollutants as defined by the US Clean Air Act, making it easier to comply with increasingly stringent health, safety, and environmental regulations. Regular macro-emulsions and organic solvents are inconvenient in many applications. They require careful handling and special procedures to properly target the desired soils and residues. Micro-emulsions, on the other hand, can be used for everything from stripping paint on industrial sprayer equipment to the removal of adhesive in LCD production and the elimination of ink from a variety of surfaces. Additionally, because each micro-emulsion targets soils of particular solubilities, they often perform better for specific tasks than general counterparts. Even vessels for transportation or chemical reactions can be cleaned with micro-emulsions, as they can easily be rinsed away with water rather than organic solvents, which is safer and more practical at a large scale. For equipment that needs to be cleaned in ultrasonic baths or elevated temperatures, micro-emulsions are stable over a wide range of temperatures and will not separate. The surfactants used in micro-emulsions can also improve the dispersion of additional organic compounds in an aqueous environment, making them an ideal base for creating solutions of different properties and compositions. They are compatible with a wide-range of co-solvents such as Limonene, Soy Methyl Ester, and NMP (tested in 1:4 ratios) as well as many thickeners, making them highly flexible in industrial cleaning applications and for further development. For industrial applications where strict health and safety or environmental regulations are in play as well as in general cleaning applications, micro-emulsions represent a major step forward in aqueous cleaning technology. View the full range of micro-emulsion concentrates on our website, or contact us for more information about how we can tailor a solution directly to your needs.